The first snow has fallen across the high ski resorts in the Alps this week ahead of the coming season - but it has not come from the skies, but from machines. Climate change has had a significant impact on the multi-million pound ski industry, and it is now becoming increasingly reliant on man-made snow pumped out on to the slops by snow cannons. The large quantities of energy used to make the snow may also be contributing to global warming. Environmentalists are also deeply concerned as millions of litres of water are used, the mountain vegetation is affected and the slopes disfigured by the cannons. However, without them the millions of people that ski each winter across Europe would not be able to enjoy their sport in the same way. Many runs, and sometimes even large sections of resorts, would have to close. A spokeswoman for the Ski Club of Great Britain told the BBC News website: "I think the resorts are looking at how they can make man-made snow in the most environmentally friendly way possible." With the season due to start in a few weeks, for some resorts in Europe there has been no significant snowfall, and already there are some worries for the all-important Christmas and New Year period. However, the recent cold weather has meant the snow cannons can get going, as they require the temperature to fall below freezing before they can make snow. They pump out water at high speed and it immediately turns to small snow granules. It is not like real snow but it does at least cover the slopes. 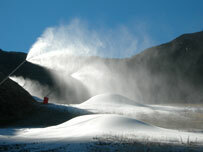 Cannons now line most of the major runs in resorts, pumping out artificial snow as soon as the weather allows. The French resort of Tignes, where 30% of the overseas visitors are British, now has over 300 snow cannons and last season made 900,000 cubic metres of snow. They put the first ones in 15 years ago. The manager of the ski patrol, Jean Louis Tuallon, said: "The man-made snow allows us to open the resort earlier and close it later. "It also means we can keep many connecting runs open so the whole area is ski-able." The huge Espace Killy area of Val D'Isere and Tignes is due to open on 25 November, but at the moment there is little chance of the full area opening unless it snows. 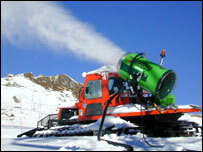 Even the 10 million euros it has spent on snow cannons will not allow that. Mother Nature needs to provide. The cannons, in any case, come at an environmental cost. Some resorts used to add chemicals to the water so that it froze at a higher temperature, but most have now stopped doing so as the additives harmed the flora and fauna, killing plants and robbing animals of their food supply. In some areas, though, the damage has already been done. Conservation group WWF says the extensive use of cannons drains the water and electricity supplies, and the building of the pipes disfigures the mountain landscape for many years. They also need to have reservoirs built to supply the water, and if natural lakes are used they are drained. Large amounts of energy are needed to pump the water round the mountainside. In Tignes alone, 3 million kilo watts of energy are used each season to make snow. However Betony Garner, of the Ski Club of Great Britain, insisted the snow sport industry was taking climate change seriously. She said: "If global warming does happen, man made snow is going to have to be used. It has been used by ski resorts for many years. "I think the resorts are looking at how they can make man-made snow in the most environmentally-friendly way possible." Ms Garner added: "People are very passionate about snow sports and I don't think something like this will necessarily put off the majority from going skiing or snowboarding." She said the club's Respect the Mountain campaign was helping to raise awareness of environmental issues with skiers. Although the changing weather patterns may have harmed the start of the season, it appears they have had a beneficial effect on the end as more snow now falls in the Spring. The only trouble is that many skiers, and the all important package tour operators, simply have not responded by shifting their holiday habits. The levels of snow across the Alps have not gone down much in recent years - but the time at which the snow falls has changed. Snow is now falling later in the winter. Last April in Verbier, Switzerland, over three quarters of a metre fell in two weeks. 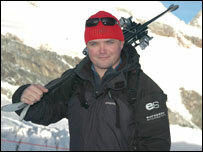 Julian Griffiths, the Director of European Snowsport, a Verbier Ski School, said: "The conditions were awesome but many people simply do not realise how good the snow now is in April and even May." 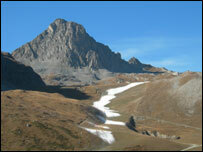 However, many resorts close at Easter with metres and metres of snow around. Perhaps skiers and the skiing industry will have to shift their behaviour if people do not want to become so dependant on snow canons and artificial snow.